Last month I had the inspiration to make something of my own design in an 18th century style. Like everyone else, I love the costumes from Outlander designed by Terry Dresbach, even though I've never watched the show. I particularly love Claire's outfit with the plaid skirt and embroidered stomacher, which I believe is from season 1. 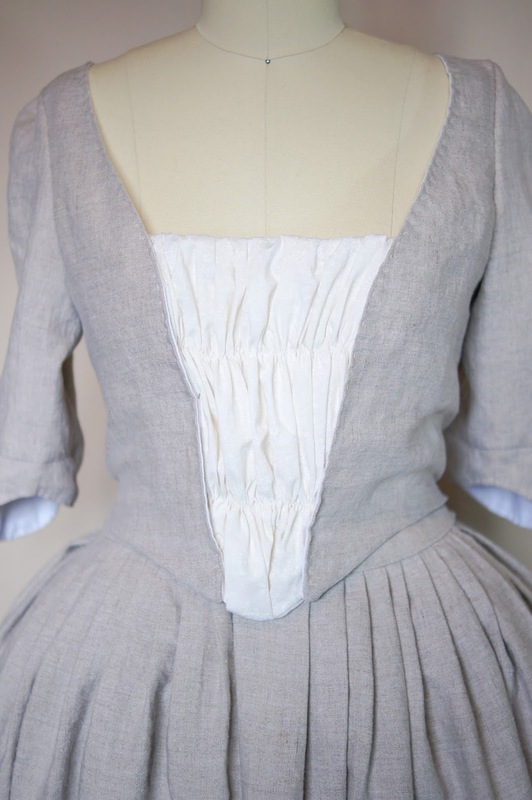 One of my favorite part of the Terry Dresbach's designs is the use of texture and all of the beautiful fabrics, so when I found a wonderful gray linen I knew I had to make something 18th century/Outlander inspired. I did a couple of sketches before I came up with something I liked. I wanted something simple and not necessarily historical accurate, but with a historical feel, which I feel I accomplished. As you can see, the dress changed a little bit between the sketch and the finished product. 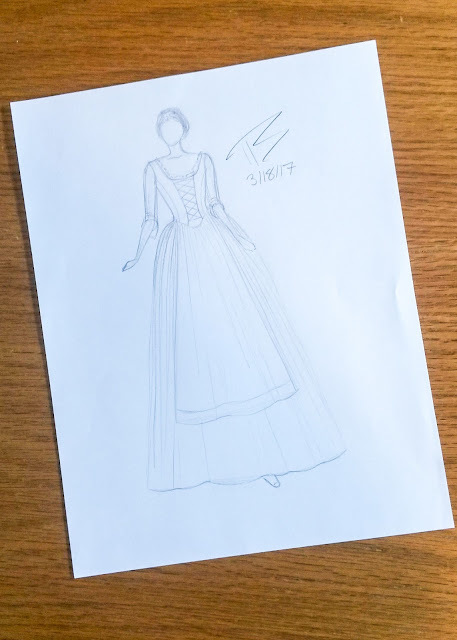 I didn't necessarily want a bodice that laces up like in my sketch, but I didn't know what I wanted to do until later in the process. 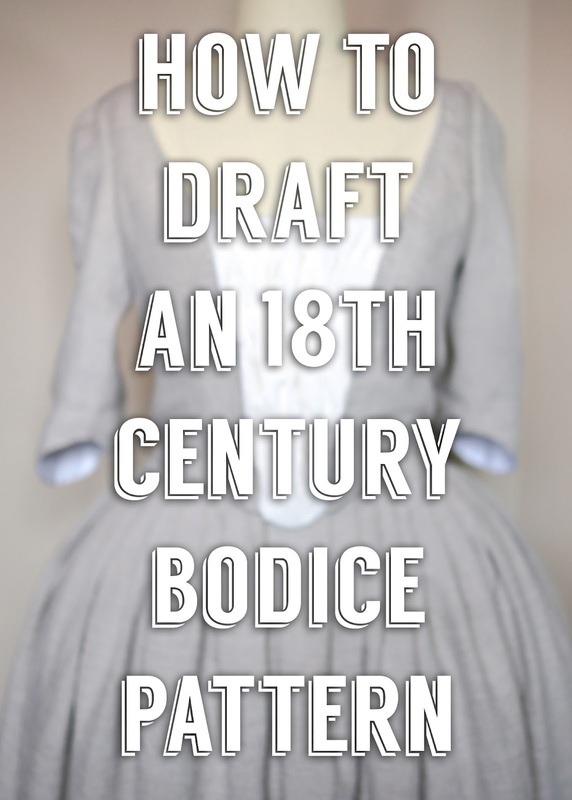 I want to walk through my process for drafting the pattern, as it's a step that a lot of people seem to skip over, but is a very important part, and that's what today's post will be focusing on. 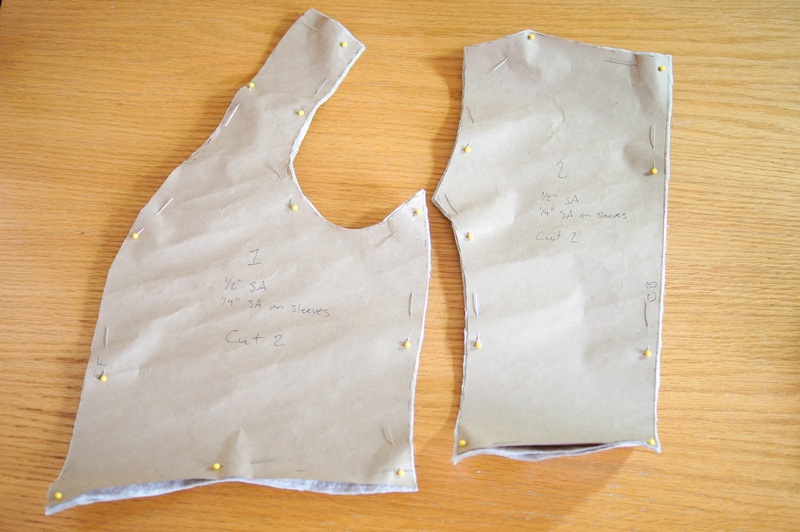 The first step in making this was to draft up my pattern. 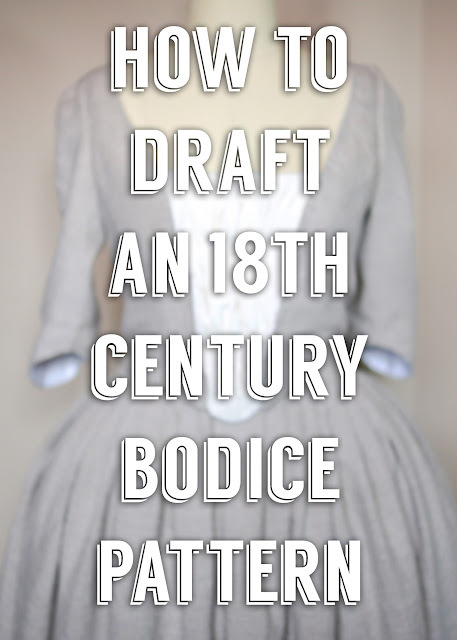 I based my bodice very loosely off of a pattern from Janet Arnold's Patterns of Fashion 1: Englishwomen's Dresses and Their Construction C. 1660-1860 . The patterned I used as a reference is an "Undress" jacket. For this costume I decided to use two 18th century petticoat's over top of an 18th century bum roll to get the right silhouette. 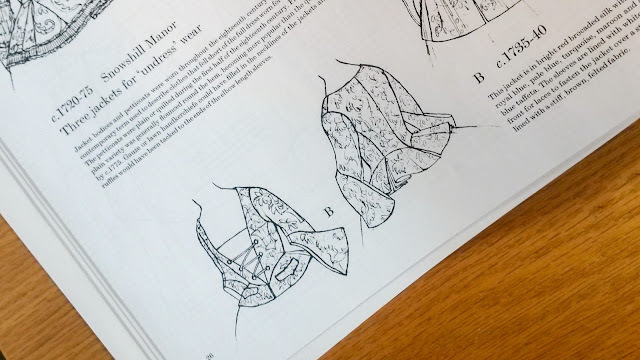 It's important that you have the proper under garments on your dress form when you're drafting so that your pattern will lay properly with all the layers. I didn't bother put my stays (18th century corset) on the dress form because my dress form is solid and they wouldn't do anything. 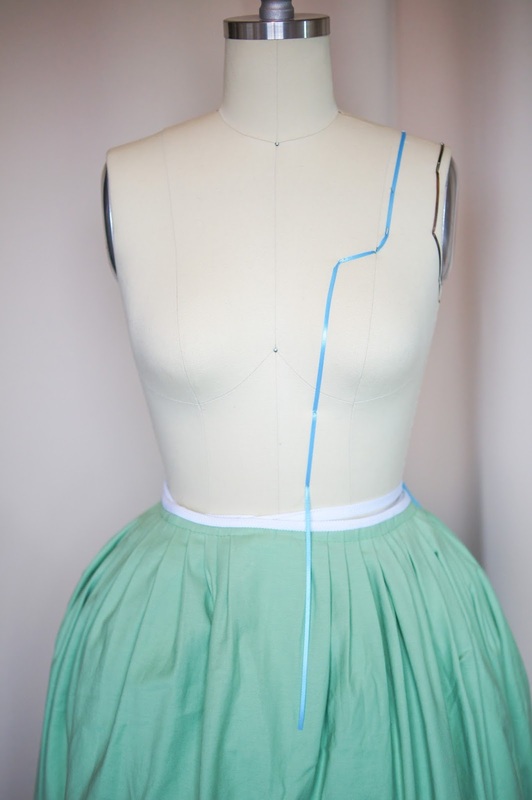 This method of drafting is done directly on the dress form by pinning ribbon onto the dress form where the seams will be on the garment. You only have to draft on one half of the dress form since the pattern will be the same on both sides. I'd like to note that the front lines of my bodice is a little bit more defined and sharp than it is in the finished bodice. I was going for a different shape when I started and didn't change that line until after I finished drafting the pattern. Once I had my seam lines tapped, it was time to start drafting the muslin. 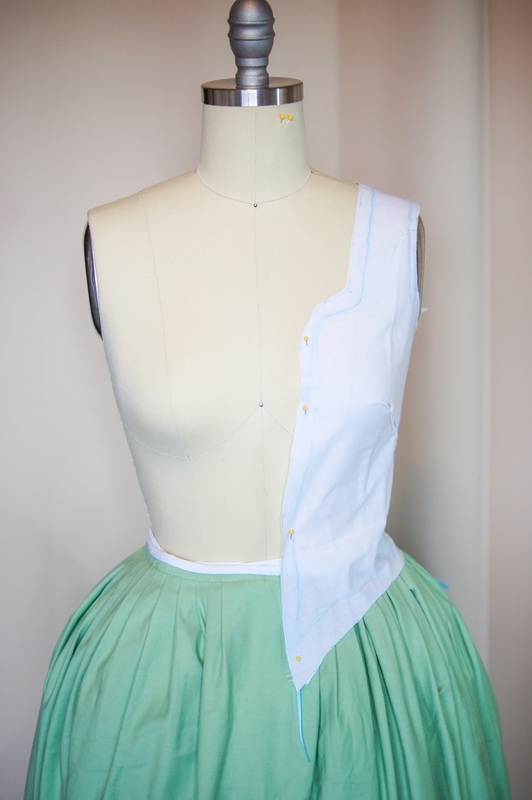 This pattern consist of 2 bodice pieces, so I cut out two separate pieces of muslin a few inches wider than the widest part on the dress form and a few inches longer. The front panel - I pinned it straight down the middle to hold the muslin block in place. I smoothed it out the best I could around the arm and over the side back, pinning it tight just past the side seam tape marking. 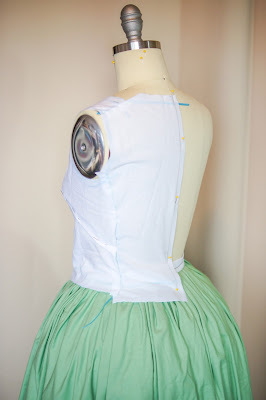 There was a bit of excess fabric around the bust, which I pinned into a bust dart which I would remove on the pattern. 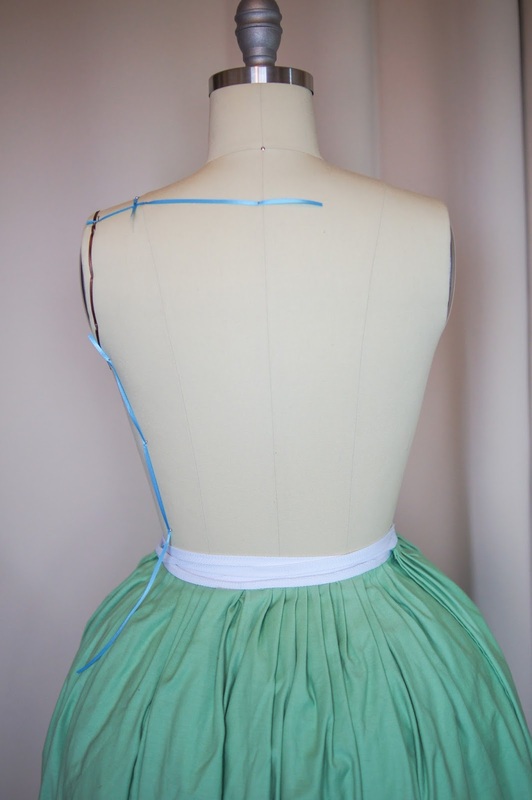 After everything was laying smoothly I proceeded to mark over the ribbon seam line with my sewing pen. Once all the line's were marked I removed the muslin from my sewing form (but left my bust dart pinned) and traced a half inch seam allowance around every seam and cut it along that line. The back panel - The back was done in relatively the same way, except before I started I drew a straight line 1 inch away from the back edge in pencil (this should have been done on my front panel, but I was rushing and forgot), which served as my center back line. 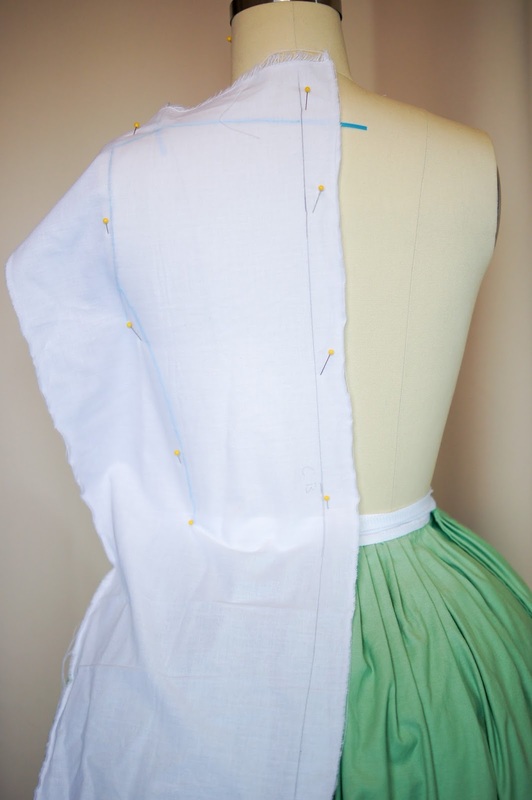 Even though the back was two separate pieces with a seam in the center back, I needed this as a guideline to lay my muslin on straight. Once my muslin block was pinned along the center back, I smoothed out the rest of the block to lay flat against the dress form. Once there were no wrinkles I traced over the ribbon markings, removed it from the sewing form, added a half inch seam allowance, and cut it out. 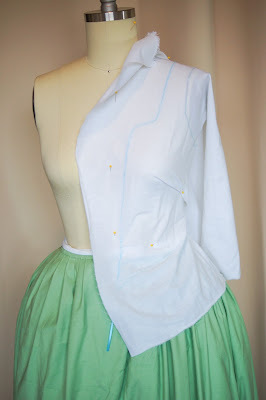 I pinned the pieces together at the seams to see how everything was fitting. Overall it fit well with the exception of the neckline *sigh* and the back neckline where it met at the front shoulder piece. I made a few adjustments to fix these things, leveled the bottom edge hem, and traced it onto paper, creating my pattern. In the end, my pattern ended up looking something like this. 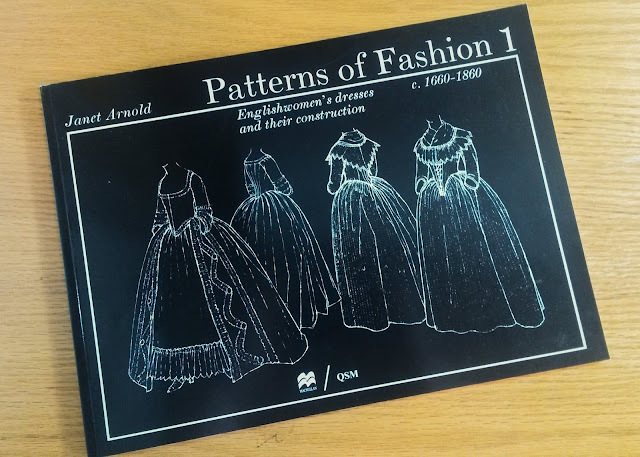 The pattern I used for my sleeve's is the same pattern I used for my 1770's Polonaise, which you can read about here. I'm still learning the art of pattern draping/drafting, but I hope this was helpful. More posts about the making of this dress will be coming soon, so be sure to check back! What's your favorite method for drafting patterns? Let me know in the comments!